Julie Delliquanti, Schatten Gallery director, is a curator of library exhibitions and of local culture. Do you have an Emory Profile suggestion? Send it to emory.report@emory.edu. Emory Report is always seeking faculty and staff members with interesting personal or professional stories to spotlight in this regular feature series. It isn't everyone who studies walls within the Robert W. Woodruff Library and sees a museum gallery. But when Julie Delliquanti views a public space, she sees an invitation to engage people. 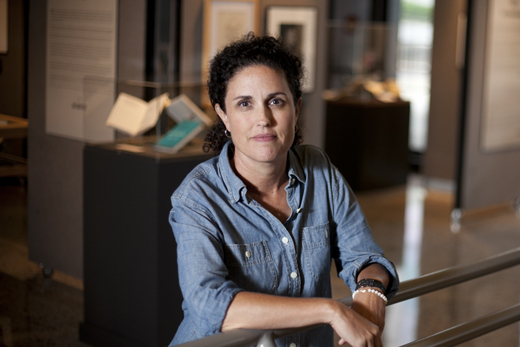 As associate curator of library exhibitions and Schatten Gallery director, Delliquanti manages and develops major exhibitions in the Schatten and Manuscript, Archives and Rare Books Library (MARBL) galleries — as well as smaller spaces throughout the building, satellite locations and beyond. Using rare documents from MARBL's collections, her exhibitions may explore the archives of contemporary writers like Alice Walker and Salman Rushdie or showcase historical images from a vast African American photography collection. An arts and culture advocate, Delliquanti has also been a driving force behind the growing partnership between the AJC Decatur Book Festival and Emory University, now a major festival sponsor. This year, her work helped bring the book festival to campus for the first time when Emory hosted a keynote address by U.S. Poet Laureate Natasha Trethewey at the Schwartz Center for the Performing Arts. In March, she was among a dozen Emory employees to win the University's Award of Distinction, which honors those who demonstrate exceptional dedication to their jobs. You were once a public school teacher. How did you find your way to museum work? Early on, there were two paths that were very interesting to me: teaching and acting. In teaching, you learn that you really have to capture the imagination of your students, take them to new places, get them to think differently, to explore new ideas — it's all part of this whole creative process. Growing up in Southern California, I was also always interested in the arts. I worked in public schools for a while, but arts funding and classes were starting to disappear. While looking for the logical next step, I was hired to execute a one-year grant project in a museum, where I spent a year reviewing 3,000 works on paper. There's something really magical that happens when galleries are empty, then you put everything on the walls, then the people come in— it's a wonderful process, I loved it. Working at the museum, I realized that the only way to get to the next level was to go to graduate school. When you came to the Woodruff Library, did you see a blank canvas? The biggest challenge is that our gallery space is not a traditional exhibition space. Most museums and galleries do not have a floor-to-ceiling wall of glass where the sun shines in all the times. It is a blank canvas, but I also have some real limitations. The good thing is that it is a major thoroughfare in one of the most heavily-used buildings on campus. Every student comes to the library — I see that as a real opportunity to engage students. So my job in developing these exhibitions is to think about how they are used, knowing that they may have multiple points of entry. Somebody may drive here to come see a show, or it may be a second-year student who had to check out some books for a class and they've got five minutes. If it's not arresting and exciting, if an exhibition doesn't capture the imagination, they're not going to stop. What new exhibits can we look forward to in the coming year? "Come Celebrate With Me: The Work of Lucille Clifton" just opened upstairs in the MARBL gallery. It will be accompanied by a smaller show, “She Sang So Sweet: Lucille Clifton's Children's Literature,” in late September downstairs on Level 2. Lucille is a beautiful poet, who passed away in 2010, and we have her papers. For many people, poetry is mysterious. To me, her work is powerful, but very understandable — simple, straightforward and accessible. In November, our current show "WRITERS" (in the Schatten Gallery) will be replaced with an exhibition derived from the Southern Christian Leadership Council (SCLC) papers curated by Carol Anderson, Michael Ra-Shon Hall and Sarah Quigley. It's going to be very rich and steeped in Atlanta history and the civil rights movement. It's also very current, in terms of the issues the SCLC was and is working on. Health care, education, immigration, voting rights — these issues are just as present today, the struggle continues. You've had a hand in some interesting projects. What stands out as a highlight? Having Alice Walker's papers here is just a triumph in my eyes. It's a beautiful collection. Working with a living author, I was very much aware that this was her life. We were making it public, providing unprecedented access to very private moments. Knowing that it was all going to be done and she wouldn't get a chance to see it until the day before it opened was nerve-wracking. But she took my hand and we walked around and talked about the exhibition, and it went very well. Also, the opportunity to work (on the Alice Walker exhibition) with the late Rudolph Byrd, who I just adored, was a huge learning experience, a real privilege. You've been a key campus advocate for the Decatur Book Festival. Are you a bookaholic? What interests you outside of work? I'm really more of a short stories-essays-poetry kind of gal. And I spend a lot of time exploring Atlanta. I'm a culture junkie, so I try to go to gallery openings, and a foodie. Though I've lived here a while, there is so much about the Southern experience that is still very unfamiliar to me. So I enjoy exploring neighborhoods and spending time with friends and really getting a taste of what it's like to be a Southerner, which is a lot of good food and drink and music and art.